A man in China named Gui Junmin decided to cryogenically frozen his better half’s dead body hoping that she will live again through this process. His wife, Zhan Wenlian, passed away due to lung cancer at the age of 49 last May. Her body is currently stored in a giant tank stored with liquid nitrogen at a cryogenic institute in Shinsadong province. Junmin then revealed that he decided to donate her body for a life preservation project. This is a collaboration by Qilu Hospital Shandong University, Yinfeng Biological Group and Alcor Life Extension Foundation, US based non-profit organization. Gui made this decision out of love and believes that his wife was not dead but rather gone somewhere to rest for a while. He is even reluctant to let his wife go and doesn’t want to see her being cremated. Apparently the couple shares a belief in modern and emerging technologies. The widower also plans to donate his body after he dies. Director Jia Chusheng of Yinfeng Biological Group revealed that this procedure might not work but it gives hope for the couple and the future. Before Zhan passed away, she agreed to have her body frozen. Experts waited on her ward until the hospital announced that she is dead 4:01 am on May 8. They injected chemicals with the likes of antioxidants and blood thinner into Zhan’s body within 2 minutes of her legal death to avoid blood clotting. Ice salt water was also used to pump to cool down her body. A CPR and a breathing machine were given on her physique to provide oxygen and blood circulation. 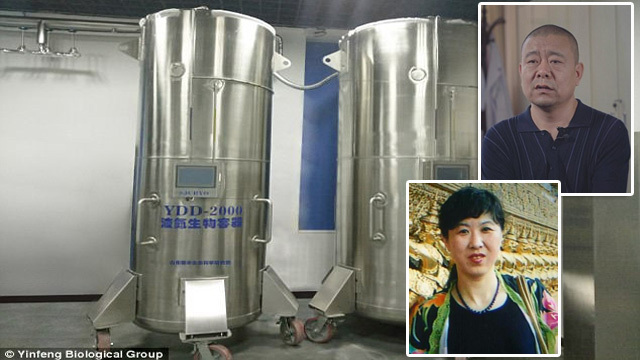 This project cost more than 7 million pesos because it is the 1st time to have cryonic freezing in China. James Bedford was the 1st cryopreserved human being in the world who died of cancer at the age of 72 on 1967.